Not all international nongovernmental organizations (INGOs) are created equal, Some have emerged as “leading INGOs” that command deference from various powerful audiences and are well-positioned to influence the practices of states, corporations, and other INGOs. Yet Sarah S. Stroup and Wendy H. Wong make a strong case for the tenuous nature of this position: in order to retain their authority, INGOs such as Greenpeace, Oxfam, and Amnesty International refrain from expressing radical opinions that severely damage their long-term reputation. Stroup and Wong contend such INGOs must constantly adjust their behaviour to maintain a delicate equilibrium that preserves their status. 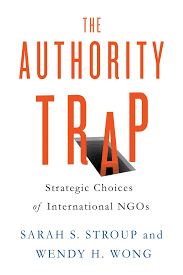 Activists, scholars, and students seeking to understand how international organizations garner and conserve power—and how this affects their ability to fulfill their stated missions—will find much of value in The Authority Trap. The authors use case studies that illuminate how INGOs are received by three main audiences: NGO peers, state policymakers, and corporations. In the end, the authors argue, the more authority an INGO has, the more constrained is its ability to affect the conduct of world politics. Sarah S. Stroup is Associate Professor of Political Science at Middlebury College. She is the author of Borders among Activists. Wendy H. Wong is Associate Professor of Political Science at the University of Toronto. She is the author of Internal Affairs.